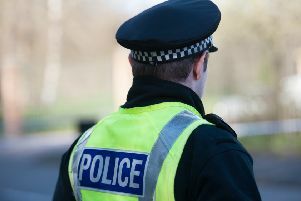 Mounted police officers were part of a team carrying out a joint operation to check and search visitors to Polmont Young Offenders Institution. Last week’s initiative saw Forth Valley Police and Scottish Prison Service (SPS) staff work together both inside and outside the perimeter. The aim of Operation Trossachs was to prevent, detect and disrupt those intent on smuggling drugs or other banned items into the prison. A number of vehicle stops and person searches were completed during the course of the operation. Sergeant Craig Heron of Police Scotland added: “We regularly work closely with our partners in the SPS to tackle the issue of drugs and other items being carried into prison. This includes New Psychoactive Substances (NPS) which have a similar effect and can be just as dangerous as more common drugs. Anyone who has information linked to the above or observes suspicious activity around the prison estate should call police on 101 or Prison Watch on 01324 777 323. Alternatively, you can remain anonymous and contact Crimestoppers on 0800 555 111.